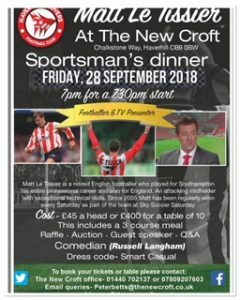 Due to unforeseen circumstances we have had to reschedule our Sportsman’s evening with Matt Le Tissier . The new date is now Friday 28th September 2018. Tickets are still available and can be purchased from the office at The New Croft.